Final version of the double sided leave behind for Great American PitchFest. Thanks to all contributing SS members, I learned a lot of what I know from you. Wow! Nice poster, dude! How'd you make that? It will be interesting to see what everyone has to say about this script. Good luck!!! I'll be giving this a read this weekend. I've read the first 30 pages twice. There's a lot of characters, but that's only a minor problem, and one for readers, not the film. You probably have just the right amount of characters for this type of film. I've never read a kids script before, so very unfamiliar ground for me. I would say you've succeeded in capturing a kid friendly tone both with the settings(bright colors, flashing lights, new technology) and with the dialogue. 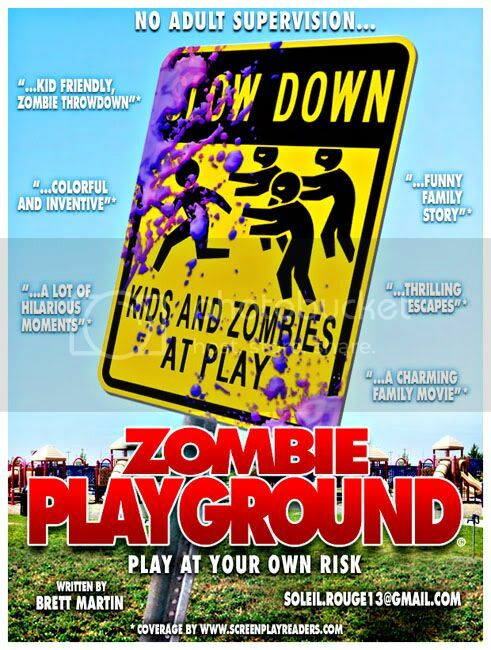 One seems to face a unique challenge with a kid's script about zombies. A major goal of a script is to create conflict and tension. But you don't want to make a kid's script really scary. So you are establishing your conflict within the Brady Bunch family setting, and in other personal relationships. I think that makes absolutely perfect sense. Some might suggest it is too familiar, but I think it is completely appropriate here. In answer to the question what do the protagonists want, I think your answer seems to be they want to unite as a family. The zombie situation is merely the temporary obstacle and ironically in the end will be the means of achieving this unification. That works for me. Normally I would wonder about some technical things. Like this zombie drug. The testing of it was kind of weird. They produced it, canned it, even created the marketing campaign; but never tested it until now. The scene with the pygmies confused me a little too. It seems they discovered a chemical that makes kids what...play a video game? Maybe I will learn more in the rest of the script. But I'm not sure whether these questions need to be answered anyway in a kids script. So based on the first 30 pages, I would say the script is colorful, family friendly and potentially a lot of fun. Oh, I liked Coach D. Again, the character is slightly familiar, but perfect for this setting. I'm not sure which direction you will go with her, but you've set it up where she can be both humorous and sympathetic, as well as a convenient plot device for other mischief. And the predator/prey game is cool, sets things up nicely with the oncoming zombies. I will finish the rest this weekend, but nice work so far Brett! Brett is going to pitch this next weekend (June 4th) so he would benefit from a quick read from the community and some positive reinforcement (seriously, after pitchfest you can tell him his script is crap, but until after pitchfest, let's focus on typos and plot holes). removed joke that fell flat. I will try to get this read and critiqued in the next few days. Looks like a good, fun read. As I usually do, I sent notes of grammar mistakes, typos by PM. I only found two, but one right in the first line. Trying to watch for them because of the circumstances. That was me. My joke was poor and in hindsight didn't want to take away from Brett's current need. Congratulations, it's a monster hit. Relentlessly energetic in the spirit of Buffy The Vampire Slayer (survival of the most clever) -- you've got some great fire power for pitch points on pages 70 (Joan's "bad touch" warning and Scott's rally cry speech) and page 83 (CEO in the chair) -- those pages ought to sell this script to any producer who really is looking for a monster hit. Love the golf cart and leaf blower scenes, especially. Your character Mason is a real charmer -- audience will love Mason. See you went with Macon's namechange. It just sounded a little weird, especially with how much bacon is in the script. I do like Mason better. I remember the first draft was 93 pages, then the second draft I read was 89 pages, and now I see it's back to 93 pages, yet the pygmies from the second draft are still in it. Is there a significant difference between the second draft I read and this draft. Did you put more in it, or just put back in a little bit of what was cut from the first draft? Thanks, I'll pass along your words to the animator/artist, my roommate. I'm blessed to have a very talented partner in crime that believes in me. And thanks again for your help in the early going with this one. You sure you never read a family feature script before? That's one hunk of insightful storytelling mechanics there, pal. I'm a big believer in "devices", especially in "hyper reality" scripts. I tried to avoid the trap here of the story being about the device. My device is in service to the family I'm writing about. I'm much more into scripts that enhance an existing story with a device. I tend to tune out on stories that merely exist to serve a flashy device. Looking forward to your thoughts, thanks so much for everything. I feel like a doof, I don't recall your first name. Thanks so much for the quicksilver read, you SS members are so kind. Wow. Joss Whedon rekindled my interest in television with that show. One of ZP's big themes is cooperation prevails. And with that cooperation comes group ingenuity. I tried hard to stick with that notion while constructing the scenes. All the while concocting scenes with high visual impact to attract interest. The challenge of trying to juggle all that is a lot of fun for me. You cited several of those "trailer moments" I was hoping folks would enjoy. But they're in service of the two families trying to reunite, so I hope they're genuine. Hmm, golf cart or go-kart? Maybe both, heh. Any neat device with wheels I can shoehorn into a story, I'll do it. Honestly, I was terrified of Mason. I've never attempted to write a feature protag of that age before. I wanted him to be integral to the sibling pairs coming together. But not resort to trickery that wouldn't be appropriate for his age. Thanks so much for your effort and thoughts. I hope ZP brought a little breezy joy to your long holiday weekend.